ID Keys: Tan and brown body. Males with obvious red throat, white eyebrow and mustache. Females with pale throat. 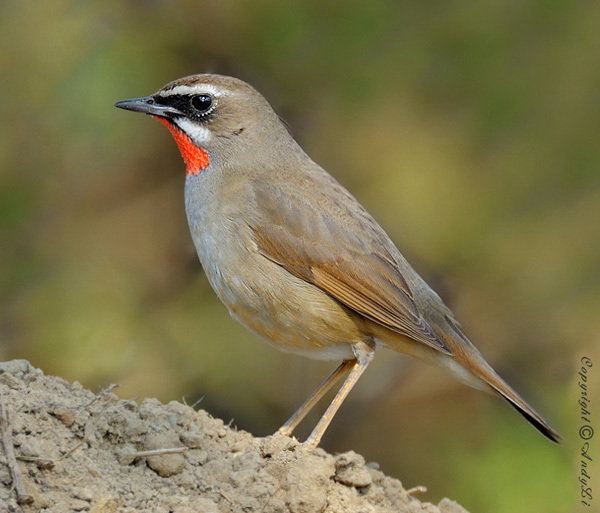 The Siberian Rubythroat is a ground-loving songbird of Asia. They primarily breed in Siberia, while wintering in southern and southeastern Asia. While very similar in overall appearance to thrushes, they may more properly be classified as Old World flycatchers, and are now often placed in the family Muscicapidae instead of the thrush family Turdidae. They have occasionally wandered outside of their normal breeding and wintering range, particularly in Eurasia where they have been found as far west as Great Britain on occasion. In North America, they are primarily known from several sightings on islands off the coast of Alaska. 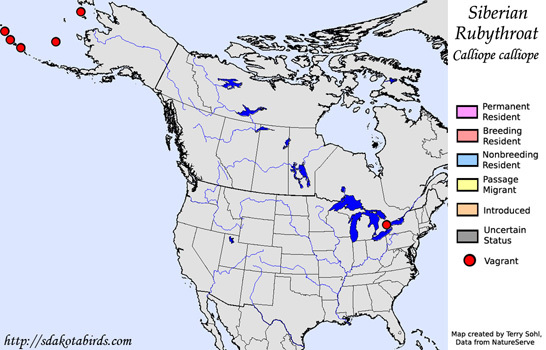 However, one very lost bird was found in December of 1983 near Toronto, Canada. Habitat: Found in brushy forest clearings, edge of taiga or boreal forest, shrubby streamside thickets, or other similar semi-open habitats with available brush. Diet: Feeds heavily on insects, spiders, worms, and other small invertebrates, but will also eat berries and fruits. Behavior: Feeding typically occurs on the ground or low in vegetation such as in shrubs and streamside thickets. Nesting: The nest of a Siberian Rubythroat is placed on the ground in a protected area such as the base of a tree or shrub, constructed of grasses, leaves, moss, hair, and other material. The female lays 4 to 6 eggs and she alone incubates them. The eggs hatch after about 2 weeks, and both parents help feed and raise the young. Song: The song of a Siberian Rubythroat is a long series of warblng notes. Calls include a loud chee-wah and a lower-pitched kuck. Migration: Migratory. During the summer they are found as breeding birds in Siberia. They move to eastern India, Thailand, Indonesia, and other nearby countries for the winter. Feeders: Siberian Rubythroats will occasionally attend feeders for offered fruits. Similar Species: The male is distinctive if seen well. The plainer females may be confused with Northern Wheatear or other thrush specides. Conservation Status: Populations are found over a wide geographic area, are common in parts of their range, and are considered stable at a global level. The IUCN lists the Siberian Rubythroat as a species of "Least Concern".